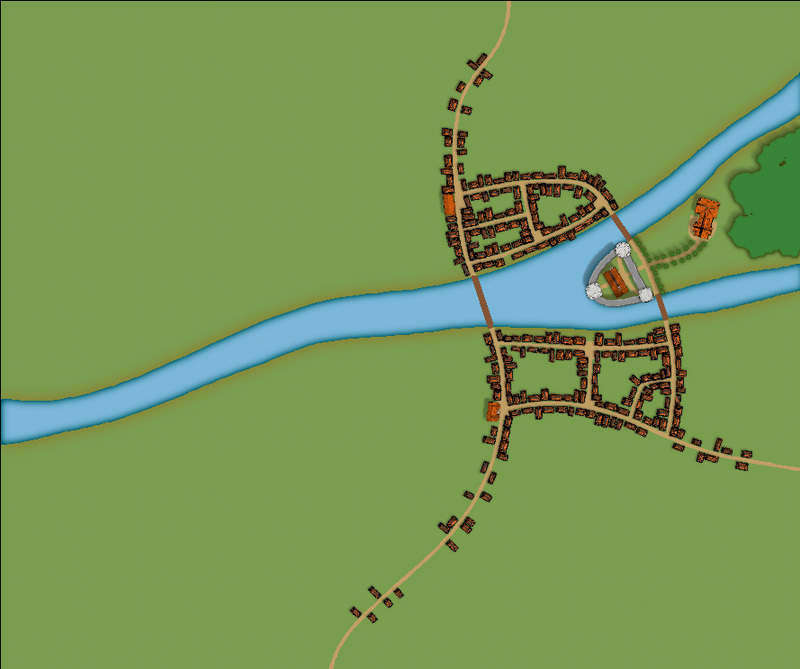 Lately I’ve worked a lot on different city maps, especially when I also made the tutorial that lasted for seven posts. 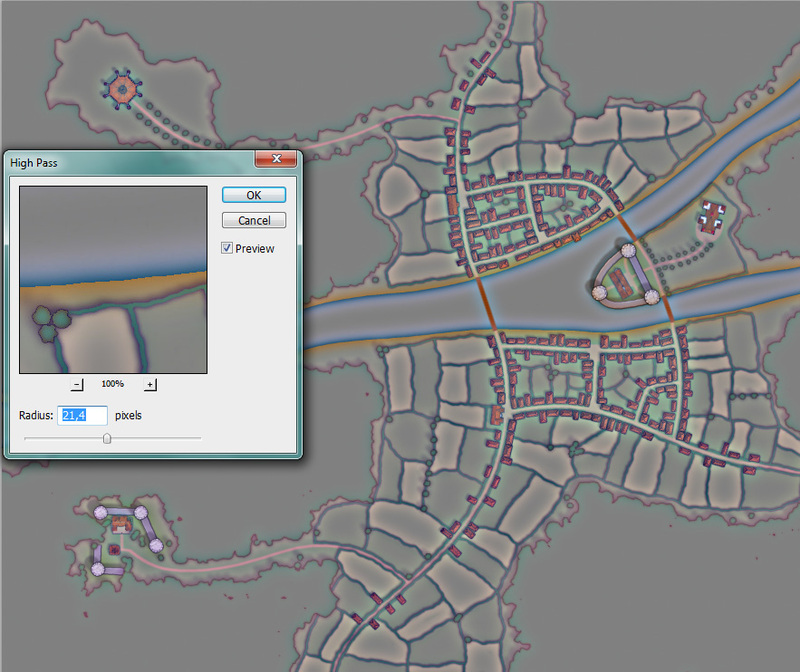 When you don’t have unlimited amount of time to spend on mapping it’s easy to use tools like City designer 3 from Profantasy. In a very short time you can create something beautiful that in a program like Photoshop would have taken you hours, that is the strength of the program. The weakness is that you don’t have the same flexibility that you do have in Photoshop. 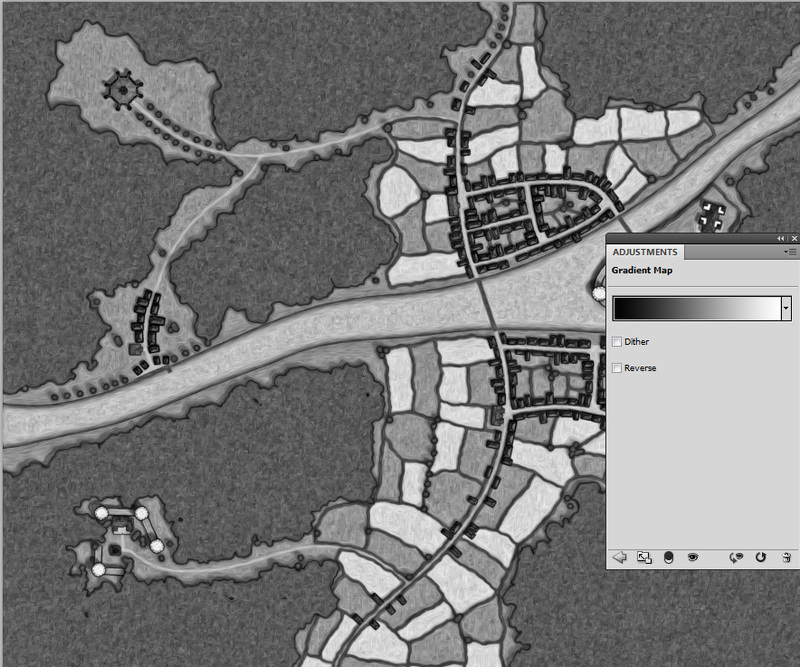 That is why I prefer to do overland maps in Photoshop and not in Campaign Cartographer 3. As you probably have figured out now this post wont be about a city but an area named the Serpents bay, on the eastern part of the”old world” in the Etrakien world, that I’m mapping. 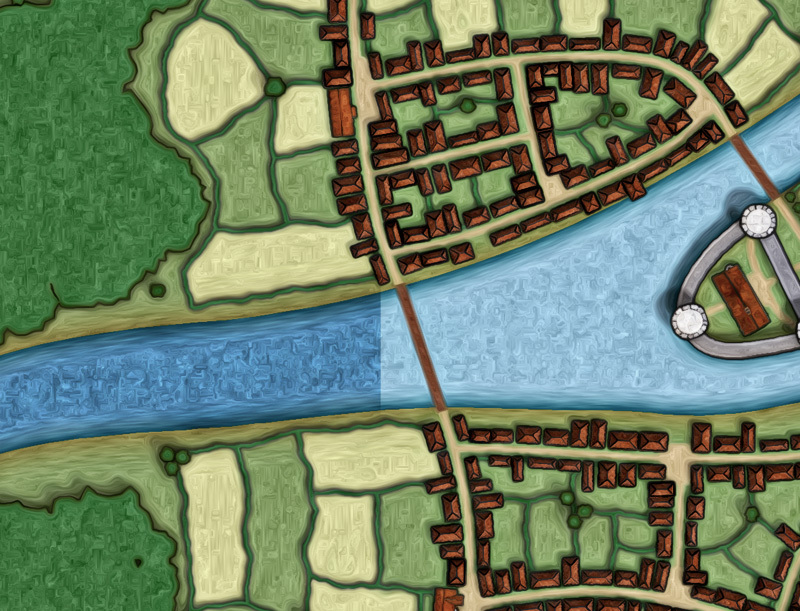 The map is completely done in Photoshop CS5 (and the Pixel bender plug-in). All graphics are made by me and the only things borrowed are the background paper texture and the compass, that both are made by the user Coyotemax over at the cartographers guild homepage. 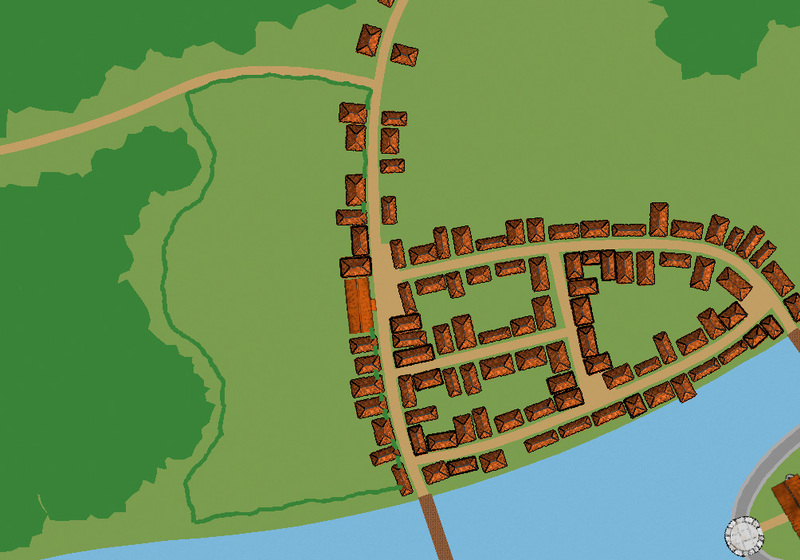 When I do maps in Photoshop I always start with a paper texture as the base, on which I’m then painting everything. That’s about it when it comes to the technical stuff. Now lets look at the map and some of the back story of the area. Serpents bay (Ormbukten) has got it’s name from the Sea serpents that return here to play before mating every three to five years. Their scaly skin, teeth, bones and blood are all valuable on the market. From the skin you get armor, teeth will be great arrow heads or spear heads and the bones and blood can be used in medicine or the dark arts. If you manage to hunt down and capture a serpent you will surely be well rewarded. But the price to do it can be high. No other creature in the known world is as dangerous as a wounded or cornered serpent. In every hunt more than one sailor will loose both his life and boat. There are two countries next to Serpents bay, Andamar and Nib. They are both known for their skill in crafting serpent armor and weapons. A trade on which they can live well. The stories say that in the beginning Andamar and Nib was only one land, but when the Etrakien Empire expanded and conquered the western part of the land, that today is Andamar, they never succeeded to get there forces over the bay. The stories claim that the serpents came to Nibs aid and killed the intruders that tried to cross the water. No one knows if that is the truth but that fact is that Nib stayed independent from the Etrakien Empire, never to be conquered. During the end of the war between the Etrakien Empire and the Arnorian Empire a revolt for independence started in Andamar that in the end resulted in the freedom of the country. Since then the relation between the former masters in Etrakien and the inhabitants of Andamar has been quite tense. When I created the map I decided to give all names in Andamar and Nib German names, in contrast to the Etrakien names that are based on Latin. The reason for this was that I wanted to make it quite clear in the map itself that we had two different types of cultures here. Two kind of cultures that in the beginning developed apart from each other. At the same time the names in Nib and Andamar shows that they share certain cultural aspects. As a side note I must admit that I don’t know neither German or Latin. All names in the map are created by combining words I translated. So if you do speak any of those two languages you might be in for a laugh :). 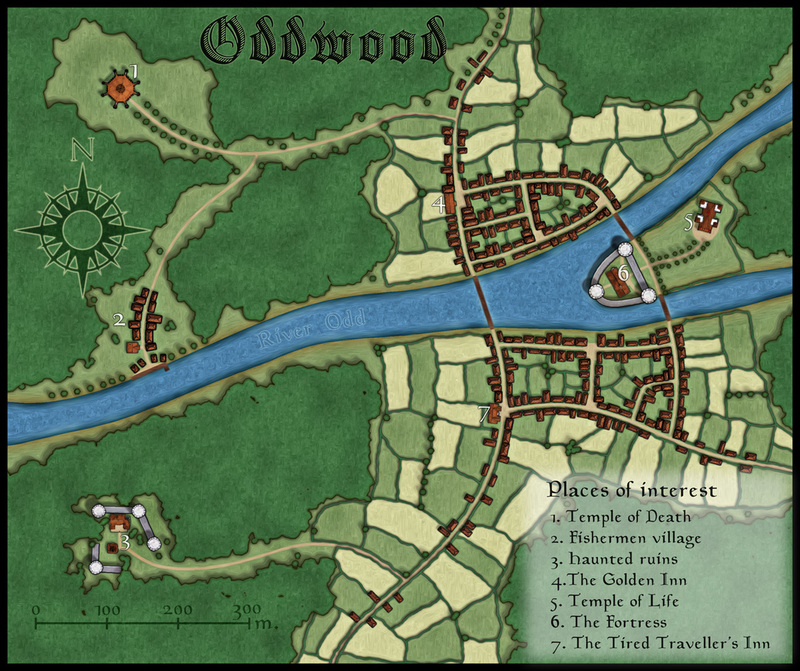 This is the finished version of Oddwood, with all the labeling in place. Oddwood is a small town in the northern parts of the kingdom Armadien close to the eastern mountains that make a natural border to Krug. In the mountains you also have some ruins from the time before the war against the gods, where unknown riches are hidden among dark catacombs and lost temples. Unfortunately for the adventurous visitors there are also all kind of monsters and forgotten demons hiding in the darkness of the place. If it hadn’t been for the ruins not many people would ever travel to Oddwood. Now there is quite some traffic passing by here. Not everyone comes back from the east though, but the lucky few who return with riches that will last for a lifetime makes sure that more will come an try their luck. 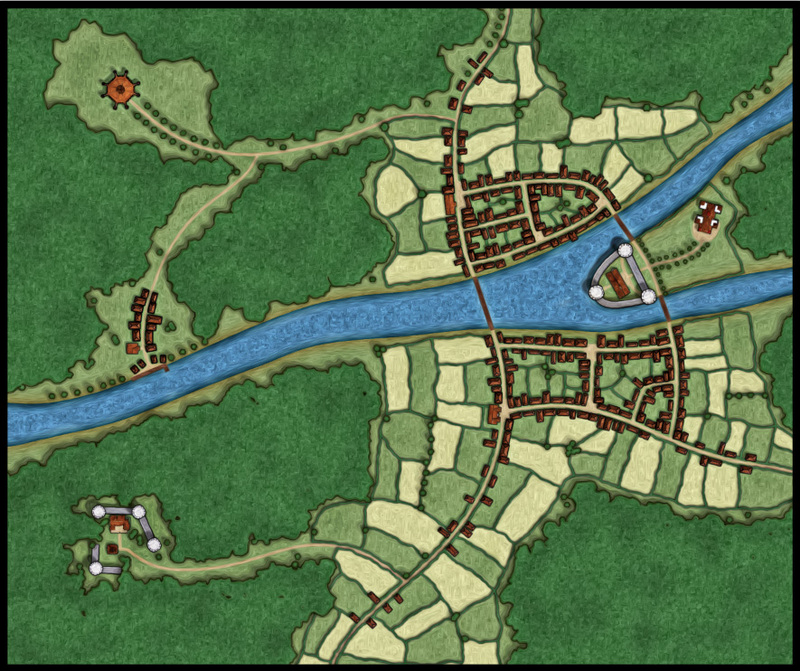 The map is done in City Designer 3 and Photoshop CS5. 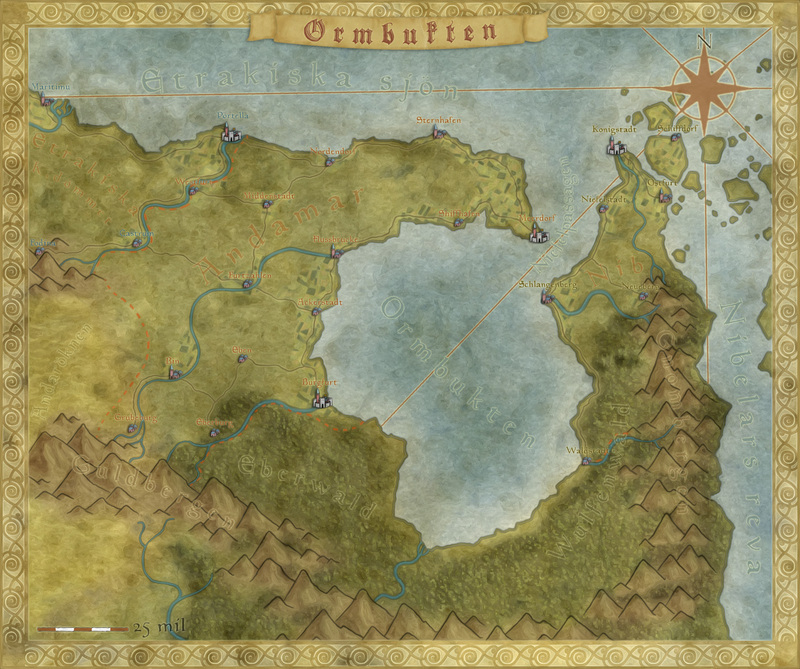 If you are interested in making a map like this yourself you can read the earlier tutorial on my blog. As I stated in my last post I think that the colours in the map are a bit too bright, so i need to do something about that. 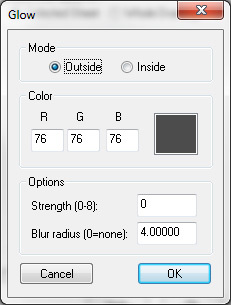 In Photoshop I create a new adjustment layer called “Gradient Map”. You find it at the bottom of the layers window. Click on the Black/white circle to open the menu shown below. The “Gradient Map” adjustment layer will add a new layer in which you can select gradient effect, select the one that goes from black to white. This will turn your picture into a black and white picture. But don’t worry all the colours are preserved in the layers below. Now it is time to lower the opacity of the Gradient map layer, when you do this you’ll see that the colours start to slowly shine through the Black and white. In this way you can control the strength of colour in your map. 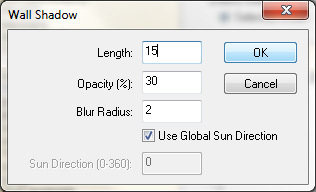 I usually set the opacity between 40-50% depending on how it looks. You have to try some different setting until you are satisfied. The next step is to darken the river. After having applied all the different effects on the map the river (or sea if you’ve made a port) tend to be too bright. The easiest way to do this is to create a new adjustment layer called curves. With curves you can darken or bright up a picture very easily. When you do this concentrate only on how the river looks, if the rest of the map start to look too dark just ignore it, we will fix that in the next step. 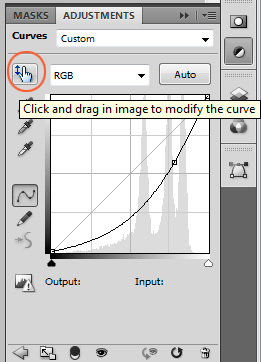 The easiest way to handle curves is to use the “Click and drag in image to modify the curve” function. To do this you click on the icon with the pointing hand (marked with a red circle in the picture below) in the Adjustments window. Now click with the left mouse button on the picture and keep it pressed while you move the mouse. this will make the picture brighter or darker. Stop when you have the result you want. Now the whole picture is dark. Add an ordinary layer mask to the curves layer, press ctrl+i to invert the mask to black. This will hide the effect you got from curves. 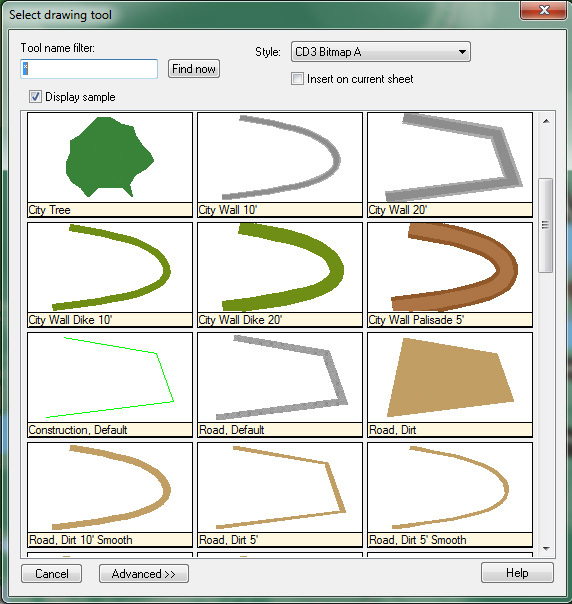 Select the brush tool and the colour white. Paint in the layer mask on the river/sea to make the curves effect show up again, but this time only where you paint. If you think the river/sea turned out too dark just lower the opacity of the Curves layer. 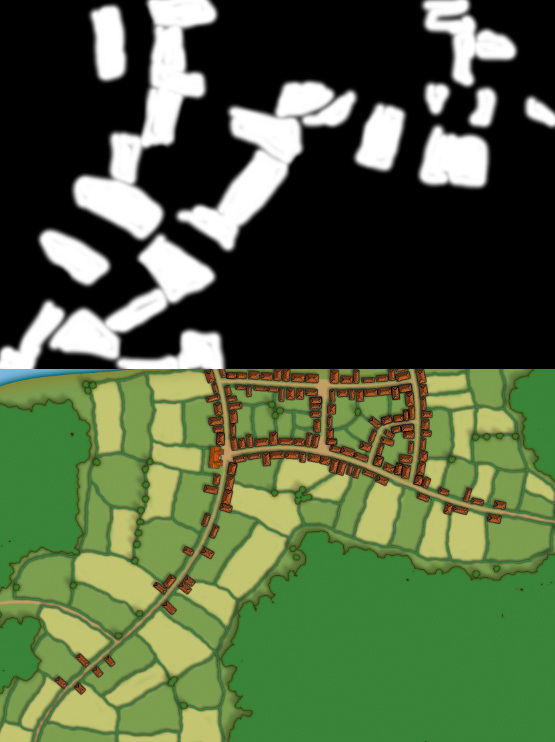 In the picture below you can see the difference in my map before and after I applied the curves layer. The left side is with curves enabled. The last thing is to add a border to the map. 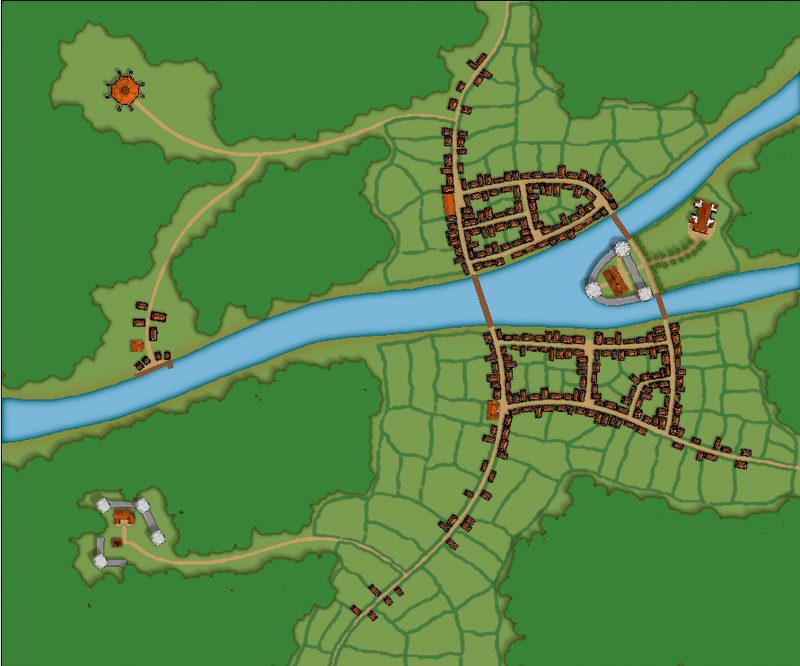 I like simple borders on my city maps that wont take over the map. This will guarantee that it is the city that will be the focus of the map. I usually just create a new layer that I name border. Select the whole image (ctrl+a) and select edit/stroke from the menu bar. The number of pixels you choose here depends on the size of your map. You probably have too try a couple of times until you get the size you want. When you are done you have a nice and simple border around your map. That’s about it. The only thing left is to label the map. Decide what places of interest there are in the map and start label them. I don’t know if there is need for a tutorial for this or not. If there is an interest I write something up, just let me know in the comments. I hope you have enjoyed the tutorial and that you have learned something new from it. Thanks for reading :). This time we will add some finishing touches to the map in CD3. After that it is time to continue the work in Photoshop. But first things first. The map we have now includes all the things that you really need so it is time to try to look at it again with new eyes to see if there are things you can improve. 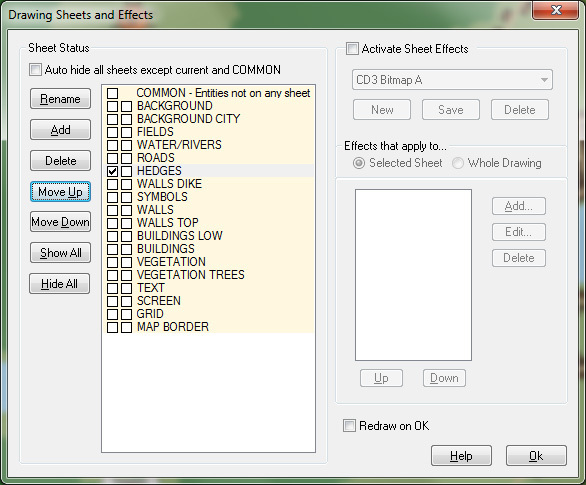 First of all I’d like to add a new sheet called TOWER (see the last post on how to add sheets). Towers are generally taller than the walls so they need longer shadows. The easiest thing to do is to try some different values and see how the result turns out. But before you can do that you have to add your towers to the TOWER sheet. On the left side of CD3 you have a tool called change properties. Click the button and select all your towers in the map. When you mark a tower you will see a white square around it (this means that it is selected). Right click with your mouse and select “Do it” from the pop down menu. A new window like the one below will show up. 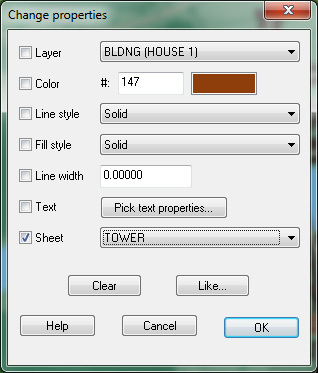 Select the TOWER sheet and click OK. This will move all the towers to the TOWER sheet, and they will now be effected by the sheet effects. Next thing to add are trees. I already have a lot of forest in my map but now it is time to add some individual trees. 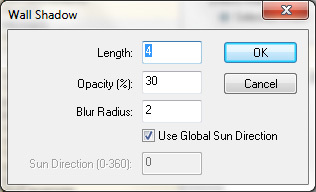 Click the “All City drawing tools” on the left side, this will open the window below. Here I select the tool “City tree”. The good thing with this particular tool is that you can decide what size your trees will be in. I add in some trees of different sizes that will make the area look a bit more alive. 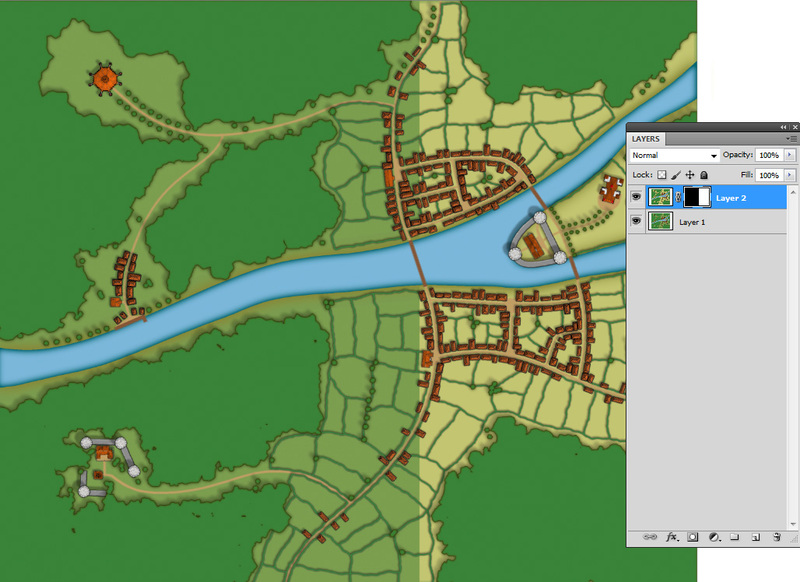 At last I’m adding some more houses to the area by the river (where you can suppose that the fishermen lives). The place looked a bit too uninhabited before. The map is now done in CD3 and it is time to continue the work in Photoshop. But first you need to export two versions of the map. One with all the fields/grass in green and on with all the fields/grass in yellow. When I export my maps from CD3 I’ve found out that you get the best result by exporting them to a Pdf file. To do this you use the print command in CD3, together with CutePdf or some other program that lets you print to pdf. The end result will look something like this (In the picture you see half of both pictures, the green and the yellow. As you can see from the layers in Photoshop, that you have two images and a layer mask). Next time we will do some more editing in Photoshop. 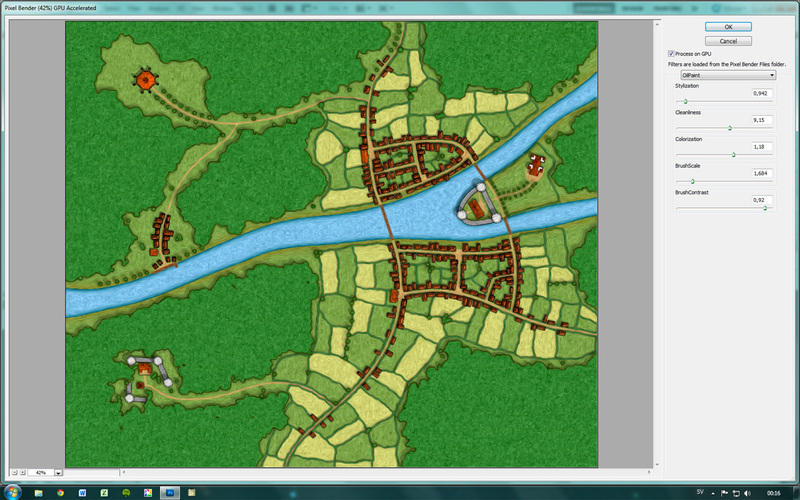 Finally it is time to start on the town itself. At the moment we have a road to the north/south and a road to the east. We also have a small fortress where the two rivers combine into one. 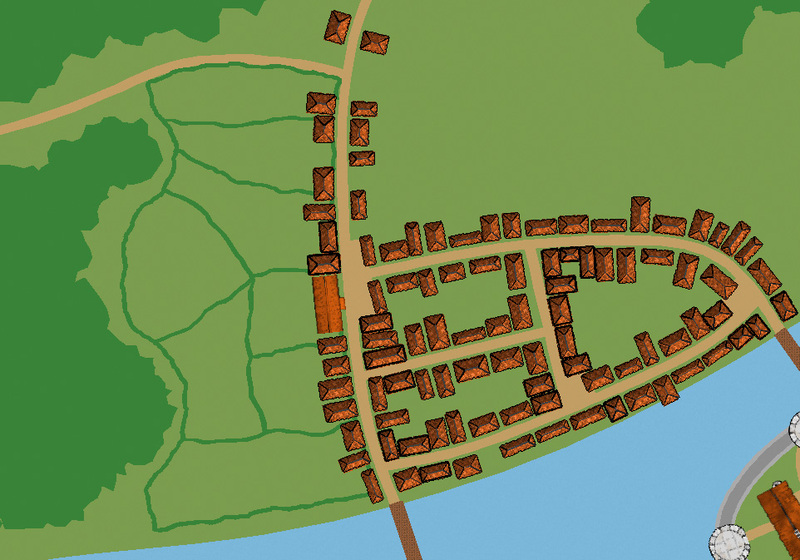 When you make your town try to look at the terrain you have and visualize how the town might have been built. In this case I started with two bridges that lead to the fortress from both sides. The bridges also have to be connected to the already existing roads. When this is done I have a natural area where my city will grow. From the outer roads on both sides down to the river I continue to add in some roads to get the right feeling of the town. Here you have to do some trial and error to see what suits your town. 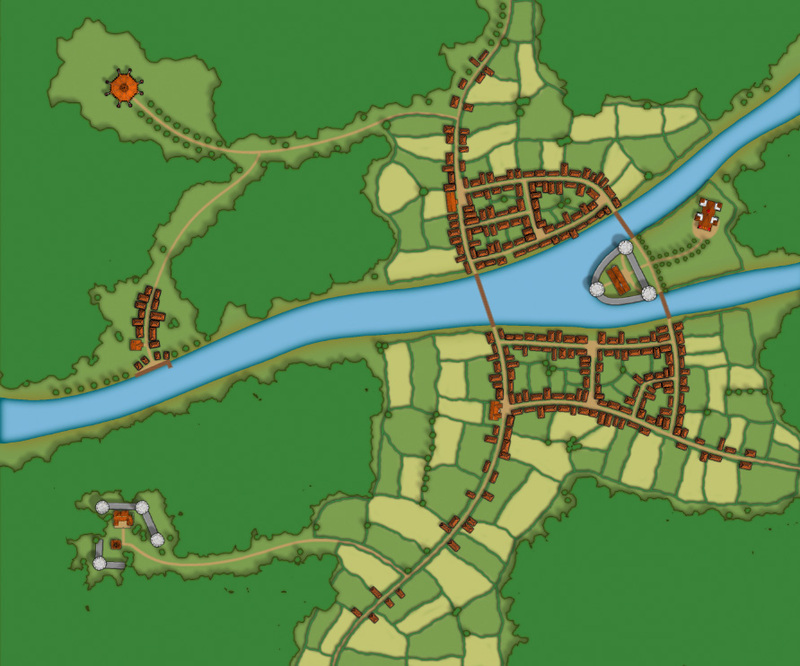 Do you want a crowded and dens town or one with more of a village feeling to it, or maybe something in between. Whenever you feel that you are done it is time to add in the houses. Adding houses is a two step kind of process. I always start with the street tool because it speeds up the process, and I start with the bigger roads. First left click on the street tool, click on the middle of the road where you want the houses to be, click a second time and start placing your houses. In this stage you just want as many houses to be placed as possible, you won’t be able to put houses wherever you want to. In some places the streets are too close to each other, wait with these places, we will fix them in the next step. When you feel like you’re done you will have something like the picture below. As you can see some areas needs some more houses and some places are too crowded, especially the areas in the outskirts of the town. The next step will be to delete some of the houses you just made. In some places they might overlap each other or block a road. I also remove a lot of the houses on the roads into town, this will give a more natural look to where the town actually starts. At this stage I also add in more houses one by one. Select the House tool and start to put houses in the town. I try to close off all green areas in the central town that are surrounded by roads. In this way you will create good looking blocks of houses. I also try to add in some details like squares or temples at this stage. Even though I use City style A for the town I usually use the individual houses from City style B, those look more hand painted, which I like. I’m adding a temple just east of the fortress and two inns. Next to the temple I also put in some forest. It is very easy to just continue in this way and adding more stuff. I usually try to think logically about what would fit into my town. If I travelled here what would I expect to find? Where do they grow crops? Do they fish? How do people get here, by foot or boat, or maybe both? I decided to put in some more forest, I mean this is actually a forest town. A small settlement to the east where the fishermen lives, and where you can arrive by boat. I also added a second temple (the temple of the dead with vast catacombs beneath it). On the south side I added a castle ruin (said to be haunted by evil ghosts). That will be all at the moment, in my next post we will start on the farmland.